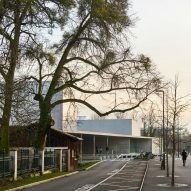 Dominique Coulon & Associés has completed a sports centre for a school in Strasbourg, featuring a pair of double-height halls that project upwards from a concrete-and-glass base. Dominique Coulon's practice designed the building for a school created for the children of the international civil servants who work at the nearby European Parliament and European Court of Human Rights. 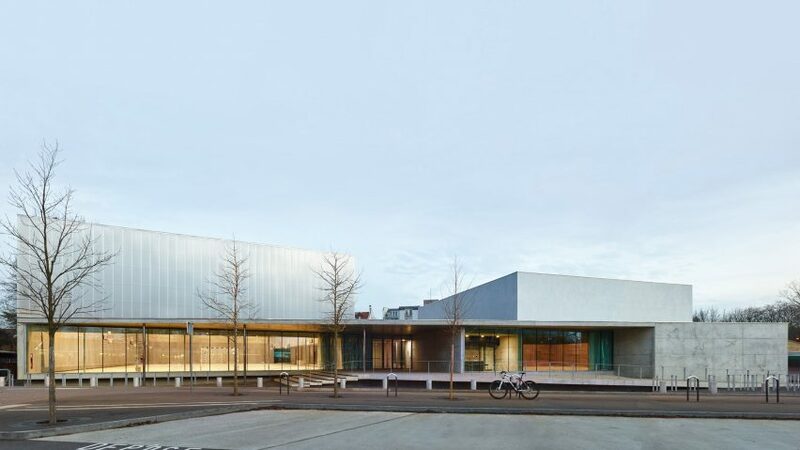 The sports centre is positioned on the opposite side of a road from the main school building, which was designed by German firm Auer Weber and French studio DRLW Architectes. 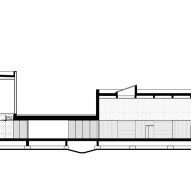 Its combination of distinct concrete forms references the existing school, which comprises a cluster of volumes grouped around a central courtyard. 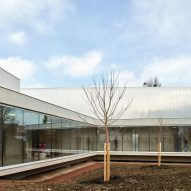 "Beyond the actual architectural and functional qualities of the building, the sports centre creates a balance and establishes a dialogue with the European school," suggested Dominique Coulon & Associés. 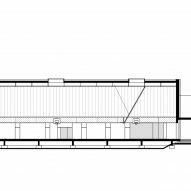 "It prolongs the logic of the fragments already used for the school building." The centre is intended to meet the needs of the local community as well as almost 1,000 pupils who attend the school. It contains a large multi-sport hall, alongside a multipurpose hall that can be used to host non-sporting events. The two halls are united by a podium at ground-floor level that also contains the central entrance hall. The glazed entrance provides a view through the building towards the woods beyond. The pair of volumes protrude vertically to create the double-height spaces required by the activity areas. 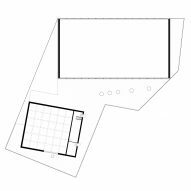 These boxes are angled to emphasise the separation of the different functional zones and optimise their relationship with the site. 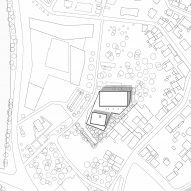 The larger hall is positioned perpendicular to the street on the northern edge of the plot, and extends away from the road to make optimal use of the site's depth. The multipurpose hall is angled inwards slightly, creating a more enclosed and welcoming feel to the entrance. 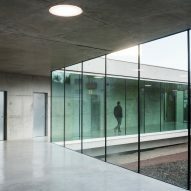 Both of the halls are lined with glazing that promotes a connection between the building and its surroundings. 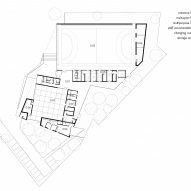 The two halls are flanked by service areas including changing rooms and storage spaces. Glazed walls wrap around the open circulation that extends towards the rear of the building and looks onto a private garden. A reduced material palette of concrete, galvanised steel, glass and linoleum results in a muted, monochrome aesthetic that emphasises the different qualities of natural light experienced throughout the day in the various spaces. 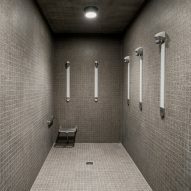 "Depending on the light, the variations in grey featured in the project range from milky and rough to transparent and reflecting," the architects added. "Perception evolves as the day draws on, setting up a valuable dialogue with nature." The box that tops the sports hall is clad in translucent polycarbonate to ensure an even diffused light during the day, and transforms into a glowing lantern-like volume when illuminated from within at night. 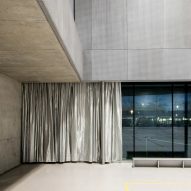 Inside the sports area, perforated MDF panels which are coloured to match the rest of the building's palette wrap around the lower portion of the walls to help improve acoustics. The interior of the square multi-purpose hall features colour that contrasts with the rest of the building and creates a warmer, more relaxing environment. 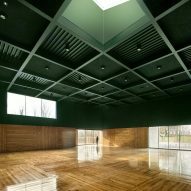 Varnished oak parquet flooring extends onto the walls of the space and is laid in a pattern that mirrors the chequerboard configuration of the dark-green coffered ceiling above. 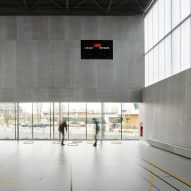 Dominique Coulon & Associés recently completed a theatre in French town of Freyming-Merlebach, which feature a red auditorium hidden with a white concrete block. The French studio also built a media library in the city of Thionville in 2017. Photography is by Eugeni Pons and David Romero-Uzeda.